This Ontario-based qualitative study examined secondary school and college textbooks’ treatment of trigonometric representations in order to identify potential sources of student difficulties in the transition from secondary school to college mathematics. Analysis of networks, comprised of trigonometric representations,identified numerous issues around the treatment of trigonometry in selected secondary and college textbooks that may contribute to a lack of coherence for the learner. The results of this study have the potential to inform discussions around the teaching and learning of trigonometry at the secondary and college educational levels to ultimately provide a more seamless transition for students. First semester college students experience many challenges – a fast-paced curriculum, more traditional teaching styles, a new social milieu, adjustments to living on one’s own for the first time, and more (Pascarella & Terenzini, 2005). Studies of the transitional process between secondary and post-secondary school have also found that students may experience difficulties in mathematics achievement (Hoyles, Newman, & Noss, 2001; Kent & Noss, 2001;Marcus, Fukawa-Connelly, Conklin, & Fey, 2007-08; Smith & Star, 2007; Wood, 2001). However, while there has been much discussion regarding students’ inability to successfully transfer fundamental mathematical knowledge to the college mathematics classroom,much of the researchfocuses on topics, such as algebra; little attention has been given to trigonometry and how multiple representations are used to teach trigonometry (Davis, 2005). This is unfortunate, because knowledge of trigonometry is crucial to success in many Ontario college technology programs, such as electrical engineering, mechanical engineering, and architectural design. In particular, being able to mathematically connect different representations or generate new representations of the same object has been shown to be a strong indicator of a college student’s mathematical knowledge and ability (AMATYC, 2006, p. 5; Kessel & Linn, 1996, p. 13).Research suggests that using multiple representations, in both teaching and learning, supports the development of mathematical understanding (c.f., Choike, 2000; Pape & Tchoshanov, 2001). In fact, when students learn multiple representations, they are preparing for the kinds of activities common to those who use mathematics in their professional work (Greeno & Hall, 1997) – activities that require selecting an appropriate representation or set of representations for a particular situation. Recent studies conducted both nationally and provincially in Canada have examined factors related to college mathematics success. For example, in a study conducted by the Association of Canadian Community Colleges (ACCC, 2007), college studentswere asked to self-report on academic skills typical of college success. The study reported that over one-third of Canadian college students did not consider themselves to have good mathematics skills, nor did they perceive that college studies helped to improve these skills (ACCC, p. 45). In a second study, the Ontario Ministry of Education commissioned The Double Cohort Study to examine the effect of curricular changes implemented in 1999. Due to changes in the Ontario curriculum, two groups of students graduated from secondary school in 2003 – one group under the previous curriculum, in which most students took five years to complete secondary school, and one group under the revised curriculum, in which students graduated in four years. The results of this study were published in a series of four research reports: Phase 1 in 2001, Phase 2 in 2002, Phase 3 in 2003 (revised in January 2004), and Phase 4 in 2005.A key finding, reported in Phase 3, found that in the double cohort year, 2003, college-bound students were “slightly less likely to meet college admission requirements” (King, 2003, p. 21) than in the previous year, i.e., 2002. In fact, “There was no clearly defined college/tech group of students” (King, p. 39). In Phase 4 of the study, King, Boyer, and Chin(2005) criticized the availability of college-preparation courses in Grades 11 and 12 noting, “Very few schools are able to offer meaningful college-preparation course sequences. Even the College Technology courses in Grades 11 and 12 are under-enrolled, and those who do enrol in them are more likely to go directly to work rather than to college” (p. 117). Thus, it is not surprising that in 2007 the Ontario College Mathematics Project (CMP) research team, examining student mathematics achievement in engineering technology at six Ontario colleges, found a low proportion (25%) of which students took the secondary school mathematics course that was listed as a prerequisite to college technical mathematics – MCT4C (College levelGrade12 Mathematics for College Technology), while more than half of the in-coming students took MAP4C (College Level Grade 12 College and Apprenticeship Mathematics) – a course designed for general college studies. By the end of the first semester, 69% of the MAP4C group were considered “at risk” compared to only 31% of the MCT4C group (CMP, 2007). That is, the College Mathematics Project found that students from particular secondary school sequences of mathematics courses did better than those from other sequences. These statistics suggest that certain courses and/or pathways1 may not provide adequate preparation for college technology mathematics. The results of CMP (2007) provided evidence of a widespread problem with student success in first-year college mathematics. A subsequent review of research literature on student transitions and mathematics difficulties suggests that gaps in content, (i.e., missing or poorly connected mathematical elements) might be a factor. Given the importance of trigonometry in college technology programs, the treatment of that content area was investigated through an examination of trigonometric representations in a sample of secondary school and first semester college technical mathematics textbooks. In particular, a focus was placed on Grade 10 – when trigonometry is first introduced – through Grades 11 and 12, into a first year college program, in order to explore the evolution of trigonometric representations between the two educational sectors. What is the relationship between secondary and college technical mathematics treatment of trigonometry? In particular, how do the representations in secondary school college pathway courses compare with the representations used in a first semester college technology mathematics course? How can this research inform the teaching and learning of trigonometry in the secondary and college educational sectors? Answers to these questions were sought through a qualitative study using Goldin’s (2003) theoretical framework of systems of representations as a lens to examine trigonometric representations. Since a key goal of the study was to examine learning sequences using trigonometric representations through secondary school and college textbooks, the research literature was examined with respect to trigonometric learning sequences and the role of textbooks in the classroom. In addition, a theoretical framework for examining and characterizing representations was sought out; that framework was based on Goldin’s theory of representations (2003). Three key research reports support specific pedagogical sequences for successful learning of trigonometry. First, Kendal and Stacey (1997) determined that students who were initially taught the right triangle representation outperformed the second group. This research suggests a specific learning sequence for trigonometry beginning with the right triangle. Second, Calzada and Scariano (2006) developed a learning sequence connecting algebraic and geometric concepts to help students formulate a trigonometric representation based on the principle of “invariance.” The sequence begins with concrete concepts identified by the authors as being familiar to the student – the properties of geometric objects, such as the triangle and rectangle, and the properties of similar triangles, congruency, and area. 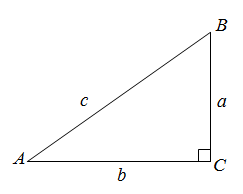 Students then review the Pythagorean Theorem, since it connects the lengths and interior angles of right triangles. Third, Pritchard and Simpson (1999) argue that the traditional instructional sequence – that is, teaching trigonometry using definitions then working on developing concepts – can lead to student problems with the construction of trigonometric images (p. 86). According to Pritchard and Simpson, a consequence is that students have difficulty transferring their understanding of algebraic functions to those of trigonometric functions. This finding supports research conducted by Tall (1992). He found post-secondary teaching tends to teach definitions then apply concept development, although the college learner may benefit from the reverse pattern – concept development then use of definitions (Tall, p. 508). The textbook often serves as an instructional and assessment guideline for teachers. Textbook authors are professional subject experts and, through their writing, make decisions about what and how mathematics should be taught and assessed. Once mathematics knowledge is printed, it tends to become institutionalized and incontestable. According to Herbel-Eisenmann (2007), the textbook becomes a guide and a source of authority for pedagogical instruction in all types of classroom settings thereby supporting a student’s enculturation into the practice and language of the mathematics community (p. 345). In fact, many teachers rely on textbooks as their main resource for teaching mathematics (Cirillo, Drake, & Herbel-Eisenmann, 2009). This is illustrated by an example in Weber’s (2005) research into the textbook’s role in guiding classroom instruction – a teacher reported that he taught by demonstrating techniques via the solutions to example problems in the textbook (p. 94). Goldin’s (2003) theory of representational systems begins with primitive characters, signs, or icons. Signs can be well defined – such as letters of an alphabet and numerals, ambiguous – such as real-life objects and their characteristics, mathematically abstract – such as vectors and matrices, or physically abstract – such as masses and velocities. Signs are combined into configurations through established rules and practices that areaccepted by the mathematics community. For example, numerals and arithmetic symbols, such as “+,” “-,” “´,” and “¸,” combine through an understanding of number and equality into equivalent numerical expressions. Configurations evolve, becoming increasingly complex or altered, based on their relationship with other configurations. They can also combine uniquely to form a unified model for a representation. Additional structure is added to the representation by rules (sometimes ambiguous), which allow movement from one configuration to another within the system “establishing a kind of network structure” (Goldin, 1998, p. 144). The final representational system is characterized by a higher structure, which relates the configurations meaningfully and provides meaning to the signs and configurations themselves (Goldin, 2003, p. 276). Font, Godino, and D’Amore (2007) and Goldin (1998) share the view that relationships between and within representational forms comprise a network-like structure; therefore, Goldin’sframework of representational systems was reconceptualised into a general representation network of trigonometry. This general network was used to organize and examine trigonometric representations identified in selected secondary and college textbooks.For example, Goldin’s ideas of primitive signs, configurations, representations, and horizontal correspondences were reconceptualized into nodes, hubs, clusters, links, and representation domains in order to sort the figures, such as words, symbols, figures, expressions, equations, and drawings, identified in the post-secondary resource textbooks. Before beginning the study, a college program that had trigonometry as a curricular focus needed to be selected. Then, the secondary school pathways suggested to prepare for this program needed to be identified. This information guided the direction of the learning sequences for trigonometry between secondary school and college studies. In order to select the college program, the engineering technology program standards from the Ministry of Training, Colleges and Universities (MTCU) website were reviewed to determine which program would include a solid understanding of trigonometry. As a result of this review, the electrical engineering technology program was deemed to have the most trigonometry content. Students entering this college program would be expected to have some fundamental understanding of trigonometry or related concepts on which to build their understanding of higher level concepts. The Ministry of Education mathematics curriculum documents from 1999 and 2000 were reviewed to determine the pathways suggested to students in order to prepare for a college technology program. Three pathways were identified. The courses that college-bound students would typically take in each pathway are shown in Table 1. I conducted using a qualitative methodological approach in three phases. In Phases 1 and 2, a general trigonometric representation network was developed using data gathered from: (a) interviews with two experienced teachers - one from secondary school, who has developed materials for the teaching of trigonometry, and one from college, who teaches mathematics and is considered an expert in electrical engineering; and, (b)an analysis of two mathematics textbooks selected for their focus on the post-secondary classroom and trigonometry.The two textbooks that were used in Phase 2 were: Trigonometry by Young (2007) and Precalculus: Mathematics for Calculus 4th edition written by Stewart, Redlin, and Watson (2002). The textbooks are published by different companies; both are written for the post-secondary student. In Phase 3, I investigated trigonometric representations offered in college and secondary school mathematics textbooks; I then used the general representation network to analyse these representations. The college textbook chosen for this study was Basic Technical Mathematics with Calculus authored by Washington (2005); this textbook was used at the college where the experienced instructor is employed. In general, this textbook is typically used in Ontario’s electrical engineering technology programs. A list of the secondary school textbooks used in this phase is found in Table 2. From Phases 1 and 2, a general representation network of trigonometry was developed (Figure 1). The network was developed as a pedagogical network and not a conceptual network. That is, the network was not designed to include all mathematical concepts that provide theoretical underpinnings for trigonometry, but to be comprehensive with respect to external trigonometric representations and concepts used in secondary school college preparation pathways, and in a selected first year college mathematics courses. Six conceptual domains were determined from an analysis of the data to comprise the representation system of trigonometry – the right triangle, the trigonometric ratios, the trigonometric functions, the unit circle, the sinusoidal waveform, and the directed ray situated on the xy-plane (or vector). These domains are shown in grey on the figure. During this process, I noted that the table representation was integral to the trigonometric functions representation; it also served as a connecting node to the sinusoidal waveform representation. In Phase 3, trigonometric representations and their development were compared and contrasted with the general representation network resulting in three pathway networks, one for each secondary school pathway. These three networks provided a visual instrument to analyse representations that are discussed in the secondary school and college sectors. In each pathway network, those representations and connections between representations that are common to the secondary school pathway and the college textbooks are shown in grey with solid bars. Solid lines indicate representations or connections only common to the secondary school textbooks in that pathway. Dotted lines indicate a representation or connection not found in the general representation network. From an analysis of the network for Pathway 1 (Figure 2), few representations needed to develop trigonometry at the college level were identified. In addition, one set of symbols and notations was used in secondary school compared to multiple notational forms used in the college textbook. All angles were identified in degrees; radian measure was not used, as it is in the college textbook. The only representation domains used in this pathway network are the primary trigonometric ratios and the right triangle. In contrast, the college representations, in order of introduction in the college textbook, included the vector, the right triangle, the trigonometric functions, tables, and the sinusoidal functions. On the other hand, the networks for Pathways 2 and 3 include representations that support many trigonometric concepts taught in a college technology program (Figures 3 and 4 respectively). Most instances of the supporting representations are presented in the Grade 11 university/college textbook. For example, this textbook is the only textbook that refers to the trigonometric functions; this textbook also makes reference to the definition of a function and its relationship to independent and dependent variables. The college textbook does not refer to trigonometric ratios; rather, it presents them as trigonometric functions regardless of the visual representation used to model them (e.g., vectors, right triangles). However, textbooks in Pathways 2 and 3 do not introduce the right triangle representation in the form shown in Figure 5, which is used heavily in the Washington textbook – and consistently in college applications for solving a right triangle (i.e., finding the lengths of all three sides), and the size of all three interior angles. Radian measure is not used in the angle measurements. There is no appreciable difference between the representation networks for Pathways 2 and 3. The only addition to the representation network for Pathway 3 is the inclusion of the quarter circle. This representation is used to develop the sine and cosine ratios for acute and obtuse angles in degree measure. The college textbook does not introduce trigonometry through the right triangle representation, a representation familiar to in-coming students; rather, the textbook uses the vector model. Even students, who have worked with the unit circle representation in secondary school, may find it difficult to understand the vector approach because they have not met vectors. Interestingly, the expert post-secondary resources by Stewart, Redlin, and Watson (2001) and Young (2007), use the circle model to introduce trigonometric functions and subsequently the sinusoidal waveform. In contrast, the secondary school textbook uses the semi-circle to introduce trigonometric functions while the college textbook does not use the circle model. Therefore, a potential gap and learning opportunity existsin the trigonometry learning trajectory as students transition to college mathematics with respect to inconsistent connections with the vector and unit circle domains. Dynamic software is used extensively in some secondary school textbooks to develop the right triangle representation, but not for other representations. Investigations using The Geometer’s Sketchpad® were used to explore features of similar triangles and relate these features to the trigonometric ratios. Other representations were not developed in this manner. Current research reinforces the importance of dynamic software to facilitate student learning in general (NCTM, 2000). This study found four examples where dynamic software was used to develop representations: Grade 10 applied and academic textbook investigations to explore similar triangles, the tangent ratio, and the sine and cosine ratio; Grade 12 college textbook investigations to develop the sine and cosine laws; and, a Grade 12 college technology textbook investigation to explore the relationship for acute and obtuse angles. The college textbook did not use any dynamic software or other forms of investigations to facilitate trigonometry learning. This study identified potential disconnections in regard to representations used to teach trigonometry across two educational sectors. From these results, it is evident that steps could be taken towards reducing the gap between secondary school and college in the learning of trigonometry. The study would suggest the following recommendations related tothree key problems identified in this study. Since college technology programs, notably the electrical engineering technology program, are heavy in trigonometry, it is important for students to arrive at college with some preparation in trigonometry; this research has uncovered discontinuities between levels. For instance, according to this research, most students arrive at college with knowledge of the right triangle representation, but the selected college textbook begins with a vector approach for which students have no background. In addition, students taking the applied stream pathway (i.e., Pathway 1), and students at college are not introduced to the unit circle representation – a fundamental representation used to model harmonic motion, electrical current, and periodic behaviour to name a few. These observations, and others, were identified from using the representation network of trigonometry. Analyses using this network have the potential to ensure a coherent curriculum between educational sectors in two ways: by identifying curriculum concepts shared between educational sectors and gaps in curricula; and, by informing classroom teaching to build on common concepts and implement teaching strategies to address gaps. Thus, curriculum planners at the two levels need to coordinate how concepts are sequenced since discontinuities can adversely affect learning and the successful transition to college mathematics. The secondary curriculum effectively sets out the representation domains, such as the right triangle, the trigonometric ratios, the trigonometric functions, the unit circle, and the sinusoidal waveform domains.The vector domain is not included in the curriculum for college bound students; as such, the secondary textbooks did not include vectors. Nonetheless, textbook writers could have some flexibility with the configurations of representations within a domain such as labelling of axes and sides, use of Greek letters or not, and developing connections between domains that are introduced in a particular course. In order to achieve this goal, teachers from both educational sectors should advise publishing companies regarding such inconsistencies in content and pedagogy. In this study, the college textbook assumed that students had met topics such as the secondary trigonometric functions, and the inverse trigonometric functions, and had experience with conventions such as Greek letters, subscripts, radian measure, and specific terminology. The study showed that some of these topics were not addressed by any secondary course, and others were only addressed in certain pathways. This underscores the need to coordinate curriculum between college and secondary school, but it also highlights the importance of ensuring that students heading for college technology enrol in appropriate pathways. The study revealed the pervasive role of technology in trigonometry learning. These findings suggest that many students may have difficulty learning trigonometry in college courses for electrical engineering technology – and potentially in other technical mathematics courses – unless the textbooks for their programs address the need for a cohesive presentation of trigonometry representations. Therefore, the idea of using an investigative approach in college should be explored. In particular, investigations using technology to capture the dynamic features of sinusoidal waveforms and the unit circle are warranted. Continuation of the investigative approach with which students are familiar would provide a more comfortable transition to college mathematics and active engagement in the learning process of new concepts. This research found gaps and omissions in a coherent pathway for students learning trigonometry between secondary school and college. These curricular discrepancies have the potential for being sources of difficulties for students in college programs. If these discrepancies are not addressed, students will continue to struggle. As a result, many students may prolong the fulfillment of or ultimately abandon their chosen educational and career goal. Not only would this be tragic for them as students, but this could lead to a delay or loss in skilled workers so critical for industries in the engineering field today. 1 For the purposes of this study, a secondary school pathway is defined as a progression of secondary school mathematics courses that prepare students for college programs. Alexander, R., Ainslie, E., & Canton, B. (2000). Principles of mathematics10. Toronto, ON: Pearson Education Canada. Alexander, R., Canton, B., Harrison, P., Nielsen, N., Sinclair, M., & Spry, K. (2000). Foundations of mathematics 10. Toronto, ON: Pearson EducationCanada. Alexander, R., Harrison, P., & Lenjosek, A. (2003). Mathematics for college technology 12. Toronto, ON: Pearson Education Canada. Alexander, R., Taylor, P., Harrison, P., Maguire, K., Rajotte, L., Sinclair, M., & Spry, K. (2002). Functions and relations 11. Toronto, ON: Pearson Education Canada. American Mathematical Association of Two-Year Colleges (AMATYC). (2006). Beyond crossroads: Implementing mathematics standards in the first two years of college. Memphis, TN: Author. Association of Community Colleges of Canada (ACCC). (2007). Report 1. Student characteristics and the college experience. In Pan-Canadian study of first-year college students. Gatineau, QU: Author. Brosseau, J., Erdman, W., Fawcett, G., Irvine, J., McCudden, B., Mehler, K., Miller, T., Perivolaris, L., & Saarimaki, P. (2001). Mathematics: Making financial decisions 11. Toronto, ON: McGraw-Hill Ryerson. Calzada, M.,& Scariano, S. (2006). A natural bridge from algebra and geometry to trigonometry. Mathematics Teacher, 99(6), 450-453. Choike, J. (2000). Teaching strategies for “Algebra for All”. Mathematics Teacher, 93(7), 546-560. Cirillo, M., Drake, C., & Herbel-Eisenmann, B. (2009).Curriculum vision and coherence: Adapting curriculum to focus on authentic mathematics. Mathematics Teacher,103(10), 70-75. College Mathematics Project (CMP). (2007).Retrieved August 23, 2009, from http://collegemathproject.senecac.on.ca/cmp/publications.php. Davis, J. (2005). Connecting procedural and conceptual knowledge of functions. Mathematics Teacher, 99(1), 36-39. Doucette, M., Edwards, B., Pogue, P., Sinclair, M., & Spry, K. (2003). College and apprenticeship mathematics 12. Toronto, ON: Pearson Education Canada. Font, V., Godino, J., & D’Amore, B. (2007). An onto-semiotic approach to representations in mathematics education. For the Learning of Mathematics, 27(2), 2-7. Godino, J., Batanero, C., & Roa, R. (2005). An onto-semiotic analysis of combinatorial problems and the solving processes by university students. Educational Studies in Mathematics, 60, 3-36. Goldin, G. (1998). Representational systems, learning, and problem solving in mathematics. Journal of Mathematical Behavior, 17(2), 137-165. Goldin, G. (2003). Representation in school mathematics: A unifying research perspective. In J. Kilpatrick, W.G. Martin, & D. Schifter (Eds. ), A research companion to principles and standards for school mathematics(pp. 275-284). Reston, VA: National Council of Teachers of Mathematics. Greeno, J., & Hall, R. (1997). Practicing representation: Learning with and about representational forms. Phi Delta Kappan,78, 361-367. Herbel-Eisenmann, B. (2007). From intended curriculum to written curriculum: Examining the “voice” of a mathematics textbook. Journal for Research in Mathematics Education, 38(4), 344-369. Hoyles, C., Newman, K., &Noss, R. (2001). Changing patterns of transition from school to university mathematics. International Journal of Mathematical Education in Science and Technology. 32(6), 829-845. Kendal, M., & Stacey, K. (1997). Teaching trigonometry. Vinculum, 34(1), 4–8. Kent, P., & Noss, R. (2001). Finding a role for technology in service mathematics for engineers and scientists. In D. Holton (Ed. ), The teaching and learning of mathematics at university level: An ICMI study (pp. 395-404). Netherlands: Kluwer Academic Publishers. Kessel, C., &Linn, M.C. (1996). Grades or scores: Predicting future college mathematics performance. Educational Measurement: Issues and Practice, 15(4), 10-14. King, A. (2003). Double cohort study: Phase 3. Toronto, ON: Ministry of Education. King, A., Boyer, J., & Chin, P. (2005). Double cohort study: Phase 4. Toronto, ON: Ministry of Education. Marcus, R., Fukawa-Connelly, T., Conklin, M., & Fey, J. (2007-08). New thinking about college mathematics: Implications for high school teaching. Mathematics Teacher, 101(5), 354-358. Pape, S., & Tchoshanov, M. (2001). The role of representation(s) in developing mathematical understanding. Theory into Practice, 40(2), 118-127. Pascarella, E., & Terenzini, P. (2005). How college affects students: A third decade of research. San Francisco: CA: Jossey-Bass. Pritchard, L., & Simpson, A. (1999). The role of pictorial images in trigonometry problems. In O. Zaslavsky (Ed. ), Proceedings of the 23rd Conference of the International Group for the Psychology of Mathematics Education, 4, 81-88. Smith III, J., & Star, J. (2007). Expanding the notion of impact of K-12 standards-based mathematics and reform calculus programs. Journal for Research in Mathematics Education, 38, 3-34. Stewart, J., Redlin, L., & Watson, S. (2002). Precalculus: Mathematics for calculus, 4th edition, Pacific Grove, CA: Brooks/Cole Thomson Learning. Tall, D. (1992). The transition to advanced mathematical thinking: Functions, limits, infinity, and proof. In D. Grouws (Ed. ), Handbook of Research on Mathematics Teaching andLearning (pp. 495-511). NY: Macmillan Publishing Co.
Washington, A. (2005). Basic technical mathematicswith calculus (SI Version; 8th ed.). Toronto, ON: Pearson/Addison Wesley. Weber, K. (2005). Students’ understanding of trigonometric functions. Mathematics EducationResearch Journal, 17(3), 91-112. Wood, L. (2001). The secondary-tertiary interface. In D. Holton (Ed. ), The Teaching and Learning of Mathematics at the University Level: An ICMI Study (pp. 87-98). Netherlands: Kluwer Academic Publishers. Young, C. (2007). Trigonometry. Hoboken, NJ: John Wiley & Sons, Inc.
Patricia Byers has taught in the community college system for 30 years. She is currently authoring a developmental mathematics textbook with the goal that it will bridge the gap for students transitioning from secondary school to college mathematics studies. This study was conducted as partial requirements for the fulfillment of a doctorate degreeat York University in 2010 which focused on college mathematics education. Dr. Byers can be contacted at: tbyers@georgianc.on.ca.